Snake Island Wall dive site, off of Nanaimo BC, is an amazing wall dive that is a must do if you are doing any boat diving in the area. The dive site is located just a short boat ride from Departure Bay and boasts a wall that drops off to over 500 feet in depth. You will want to be absolutely sure of your buoyancy control, before you start down the wall! The wall it self is loaded with marine life, most prominent being vertical fields of glossy white Plumose Anemones. Lots of fish also like to hang out along the wall or in the nooks and crannies. Large Ling Cod and Cabezon are regulars at this site. Simply tie up at the buoy you will find on the side of Snake island that faces Nanaimo, and then head straight away from the island. Should be about due south! You will first encounter a fairly shallow shelf area where it is a good idea to make sure of your set up, and then when you go over the wall, base your direction on the direction of current. The wall itself begins tamely enough, but as you start getting down 50ft plus, you will see what I meant about being sure of your buoyancy. I could only come up with one word to describe it. Abyss! You may even want two allot two dives at this great dive site, for this is an excellent location, where there is plenty to see no matter what depth profile you choose. Most visitors will probably head for either of the two war ships which are located on the opposite side of Snake Island. But trust a locals advice and do not miss diving the Snake Island Wall. 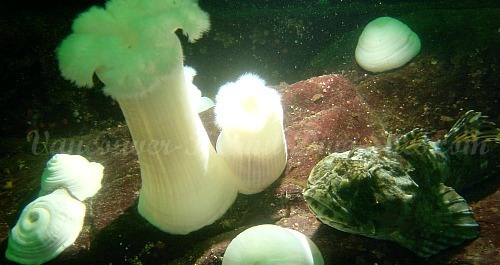 This is one of Nanaimo BC's premier dive sites and one of my personal favorites. It is nothing short of awesome and I highly recommend this dive! There is a lot to be said about such a spectacular dive site that only mother nature has had her hand in! The HMCS Saskatchewan and the HMCS Cape Breton dive sites are both excellent dives, and are only a few minutes away from Snake Island, so take advantage of being out there and do a couple of dives. Divers will often dive on one of the wrecks and then the wall or vice versa depending on what the wind or tide is doing. One way or another though, do the wall dive! Another draw to the Snake Island Wall dive site is the large amount of Seals and Sea Lions that you will often encounter while scuba diving at this location. They can be quite curious and it sometimes makes for fun, and good photo op's. Which reminds me, bring a camera if you have one.